Henri Cramail received his engineering degree from the Ecole Nationale Supérieure de Chimie et de Physique de Bordeaux in 1987. He obtained his PhD from the LCPO, University of Bordeaux 1, in 1990 for studies in the field of ring-opening metathesis polymerization under the supervision of Profs Alain Soum and Michel Fontanille. After a post-doctoral stay with Prof. W.J. 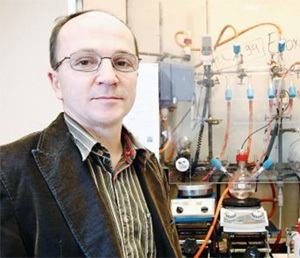 Feast at the University of Durham, U.K., he became an Assistant Professor of Polymer Chemistry at the University of Bordeaux 1 and, since 1999, he has been appointed Professor of Polymer Chemistry at the same University. In 2004, he was awarded the position of Junior Member of the ‘Institut Universitaire de France’. Since 2007, he is the Director of the Laboratoire de Chimie des Polymères Organiques (LCPO). His research interests concern (i) the coordination polymerization of olefins with a specific focus on single-site catalyst organic supports, (ii) step-growth polymerizations in dispersed media (organic phase, water, super critical CO2) to design core-shell particles with specific properties and, more intensively today, (iii) the development of new bio-based polymers from renewable resources (vegetable oils, terpenes) through green pathways (catalysis and processes). Please follow the link for further information on Henri’s laboratory and his recent paper in Polymer Chemistry. The real motivation to be a chemist is probably the strong will to discover and to ‘create’ something new that can have an impact in our daily life! But shall I (we) succeed? It is well-known that metallocene catalysts used for olefin polymerization have to be fixed onto a support to be used in industry. However, some single site catalysts may be deactivated or loose their stereoselectivity when supported on classical inorganic carriers (MgCl2, silica) and, in addition, traces of these inorganic supports may remain in the polyolefin material thus affecting its properties. Making more versatile organic supports composed of self-assemblies of either functional polymers or block-copolymers can thus be a solution to overcome these two issues. Moreover, the methodology we have developed in this manuscript is very simple and quite efficient to prepare polyolefin beads, under mild conditions. This is a relatively new journal that attracted me because of the quality of the work published and also because having a new journal mostly devoted to the Chemistry of polymers is, from my point of view, very important for our scientific community. I will attend the 103rd AOCS meeting in California (Long Beach, CA) on 01-04 may 2012 and the 44th IUPAC world Polymer Congress in Virginia on 24-29 june 2012.